The Wollesen Memorial Graduate Symposium is the annual symposium for the Graduate Union of the Students of Art (GUStA). The history of display tactics of visual and material culture created staging realms that imbued problematic and controversial resonances, shaping today’s culture and society. 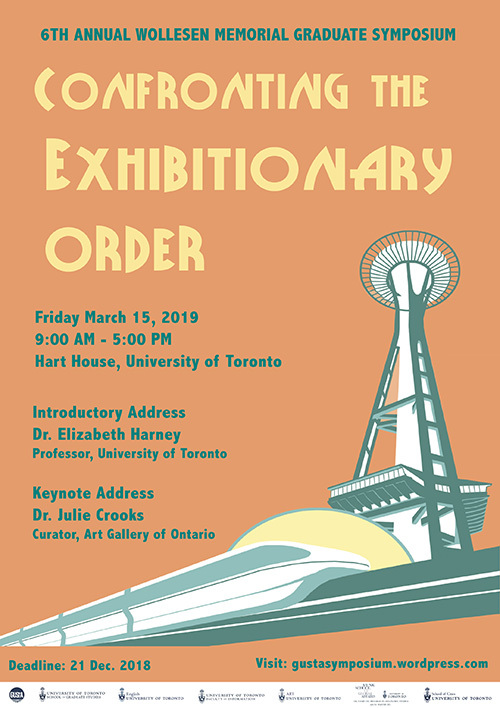 We welcome innovative contributions that critically engage with the history of exhibitionary orders and classification systems as tools for defining, ordering, and representing the world as an endless exhibition. Modernism as an aesthetic movement presented itself as ahistorical and transnational, grounded in essentialism and universality. However, the classification systems that helped inform modernism were dependent on comparative cognitive shortcuts and coded stereotypes that lay claim to the superiority and accomplishments of western civilization. World fairs are pivotal examples of how classification systems operated, as they become staging realms where countries were systematically organized from least to most civilized. Anthropological and ethnographic research also substantiated a lot of racist stereotypes, contributing to this narrative of objective ordering. This symposium seeks to question how the creation, presentation, and dissemination of visual and material culture and knowledge have resulted in the perpetuation of problematic imperial hierarchies. Debates around reparations continue to percolate in today’s political climate, urging us to interrogate the display tactics of museums, galleries, and biennials, as well as larger questions of exhibitionary orders in the world. In collaboration with HASA’s conference titled “The Problematic in Art,” the Wollesen Memorial Symposium hopes to facilitate a productive discussion that challenges the problematic histories and practices of display, particularly viewing and ordering the world as exhibition.